Great literature illuminates the world around us and delves into the depths of the human soul. At Catholic University, your love of literature will help you confront and consider different writers' explorations of human, social, and metaphysical issues, challenge and strengthen your ethical imagination, and root you in a dynamic cultural tradition. An English major will deepen your knowledge of literary and artistic traditions, of history, make you a better reader and writer, and refine your aesthetic judgments. Literature poses many of the same questions as philosophy, theology, the social and natural sciences, and the other humanities. Core courses in these related disciplines will both broaden and deepen your exploration of what it means to be human. With well-honed interpretive and analytical skills and the ability to comprehend and express complex ideas in writing, you will be well prepared for the world of work. The study of English is also good preparation for a wide range of graduate studies. Geoffrey Chaucer, Alexander Pope, John Dryden, John Henry Cardinal Newman, Gerard Manley Hopkins, James Joyce, Anthony Burgess, Graham Greene, Allen Tate, Caroline Gordon, Robert Lowell, Evelyn Waugh, Katherine Anne Porter, Flannery O'Connor, Walker Percy, Seamus Heaney, Dana Gioia, William Kennedy, Annie Dillard, and Kate Daniels are among the wide spectrum of creative writers who have contributed to the Catholic intellectual tradition. Exploring their art and thought within the broad context of literary history will enliven your sense of Catholicism's contributions to literature in English. Located in the heart of Washington, D.C., The Catholic University of America offers a variety of opportunities to enhance your study outside of the classroom. As home to the Folger Shakespeare Library, a number of theatre companies (including the Shakespeare Theatre Company), and the Library of Congress, D.C. will become your second classroom. English majors at The Catholic University of America belong to a close community of professors and students who enjoy reading and talking about great literature and big ideas. Conversations that begin in class spill over into out-of-class get-togethers, including meetings of the Catholic University English Society. 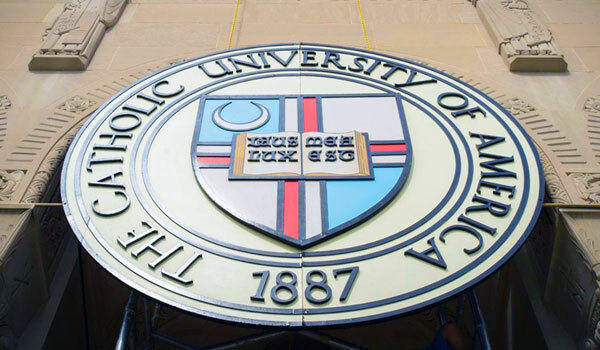 With a broad cultural background and command of clearly conceptualized, well-written prose, and finely honed analytical skills, The Catholic University of America English majors are an asset in just about any workplace. In addition to serving as teachers, English majors work in a variety of career areas including publishing, editing, and writing. They also go on to graduate study in English, law, or business.